Béraud, Alain, and Guy Numa, G. 2018. “Keynes, J.-B. Say, J. S. Mill, and Say’s Law: A Note on Kates, Grieve, and Ahiakpor.” Journal of the History of Economic Thought 40: 285–289. Kates, Steven. 1998. Say’s Law and the Keynesian Revolution: How Macroeconomic Theory Lost Its Way. Cheltenham, UK: Edward Elgar Publishing. Kates, Steven. 2008. “A Letter from Keynes to Harlan McCracken Dated 31st August 1933: Why the Standard Story on the Origins of the General Theory Needs to Be Rewritten.” History of Economics Review 47: 20–38. Kates, Steven. 2015a. “Mill’s Fourth Fundamental Proposition on Capital: A Paradox Explained.” Journal of the History of Economic Thought 37: 39–56. Kates, Steven. 2015b. “Reassessing the Political Economy of John Stuart Mill” (July 2015). Online discussion. 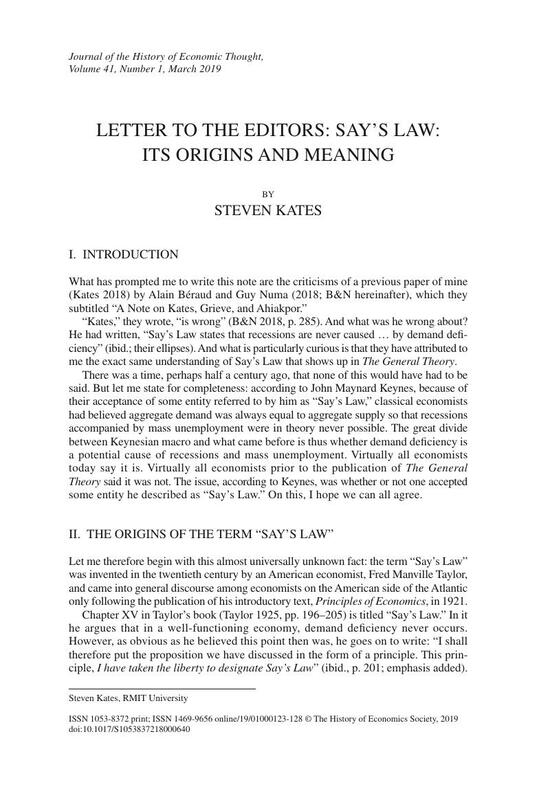 Number 16: “Mill’s Defence of Say’s Law and Refutation of Keynes.” Posted: July 27, 2015. Indianapolis: Liberty Fund. http://oll.libertyfund.org/titles/liberty-matters-reassessing-the-political-economy-of-john-stuart-mill-july-2015. Accessed 26 October 2018. Kates, Steven. 2018. “Making Sense of Classical Theory.” Journal of the History of Economic Thought 40: 279–283. Keynes, John Maynard. 1972. Essays in Biography. Volume X: The Collected Writings of John Maynard Keynes. Edited by Moggridge, Donald. London: The Macmillan Press. Keynes, John Maynard. 1972. The General Theory of Employment, Interest and Money. Volume VII: The Collected Writings of John Maynard Keynes. Edited by Moggridge, Donald. London: The Macmillan Press. Mill, James. 1966. Commerce Defended. Second edition. In Winch, Donald, ed., James Mill: Selected Economic Writings. Edinburgh: Oliver and Boyd Ltd, pp. 85–159. Mill, John Stuart. 1921. Principles of Political Economy with Some of their Applications to Social Philosophy. Seventh edition. Edited with an introduction by Ashley, Sir W. J.. London: Longmans, Green, and Co.
Mill, John Stuart. 1974. “Of the Influence of Consumption on Production.” In Essays on Some Unsettled Questions of Political Economy. Second edition. Clifton, NJ: Augustus M. Kelley, pp. 47–74. Smith, Adam. 1976. An Inquiry into the Nature and Causes of the Wealth of Nations. Edited by Cannan, Edwin. Chicago: University of Chicago Press. Taylor, Fred M. 1925. Principles of Economics. Ninth edition. New York: The Ronald Press Company.